This month marked the 50th anniversary of the death of screen legend Marilyn Monroe. As with most anniversaries, morbid and not, people come out of the woodwork trying to make a buck. There have been releases of never before seen photos, film festivals on television and of course book releases. One of the few fiction books that came out this summer is, ‘The Empty Glass’ by J.I. Baker. It’s formatted like a mystery, with an employee of the L.A. Coroner’s office playing the part of detective. The mystery being, did Marilyn Monroe commit suicide or was she murdered? Ben Fitzgerald, the Deputy Coroner, is on the scene shortly after Marilyn’s death is reported to authorities by her housekeeper and psychiatrist, and he is firmly of the opinion that Marilyn was murdered. He finds himself alone in that opinion as his boss rules her death a suicide, even after a less than convincing autopsy. He decides to go back to Marilyn’s house and reexamine the scene of her death and take a closer look at a diary he had earlier seen hidden under her pillow. Marilyn’s ‘Book of Secrets’ only confirms Fitzgerald’s suspicions that she was murdered. The diary’s secrets are powerful and heartbreaking and reveal that Marilyn’s life may well have been in danger by what and whom she knew. As Fitzgerald goes about trying to discover the truth about her death he finds himself becoming as paranoid and unraveled as Marilyn. Is he losing his mind or are the forces that killed Marilyn out to get him too? Mixing the facts of Monroe’s death with the legendary conspiracy theories, Baker did a great job of turning a true event into a mystery thriller. I am one of those people who truly believes she was murdered by either the Kennedy’s or the mob, so I liked the author’s slant in that same direction. The one problem I had with this book was its failure to transport the reader to the time period in which the events took place. 1960’s characters using lingo from a more modern era just felt like careless writing or editing. I’m probably just being a bit picky. 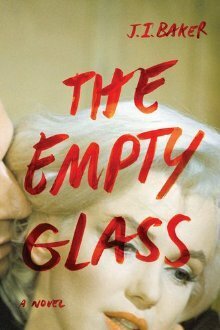 If you’re fascinated with the real life mystery and like a good thriller, then you will enjoy ‘The Empty Glass’. This entry was posted in book reviews, BOOKS and tagged Death, J.I.Baker, legend marilyn monroe, Marilyn Monroe, Murder, Mystery, Mystery thriller, The Empty Glass by Tracy 'jottingswithjasmine'. Bookmark the permalink.